The Jaguar XJ saloon offers everything we’ve come to expect from Jaguar, albeit in a fantastically stylish and modern package. The lowest-priced XJ still offers opulence. Great twin-turbo diesel makes this the best-seller. The V8 Supersport is the money-no-object option. Interested in buying a Jaguar XJ? Jaguar XJ represents a huge leap forward in looks compared to its much more conservative predecessor. Our week-long test drive confirmed this is a car which turns heads and does so for all the right reasons. Maserati Quattroporte. Elsewhere the cabin is punctuated with quality touches, from the rotary gear selector to the robust round air vents. The 520 litres boot space means you could easily pack for a week-long holiday, while the broad entrance enables you to stow reasonably bulky objects. The boot lid can be operated electronically, a convenience you quickly get used to when laden with luggage. The cabin is roomy and features generous storage solutions. Models are available in standard or long wheelbase form. BMW 7-series and body roll through corners is minimal. Buyers who want to have fun behind the wheel need look no further – which is presumably why one has found a home with US TV star and petrolhead Jay Leno. However, this is not at the expense of those in the back seat with Professional Driver Magazine naming the XJ its 2010 Car of the Year. For our week-long test we drove the 275hp 3-litre diesel twin-turbocharger model which still manages to cover 0-62mph in a brisk 6.4 seconds while boasting effortless overtaking power. The diesel is also very quiet, more than one unwitting passenger asked the fuel type during our loan. All engines are mated with a six-speed automatic transmission. Jaguar Drive Control adjusts the responses of the accelerator, gear shift responses and steering for a more sporty experience. It also tightens the seatbelts, a neat trick which sets the pulse racing a little faster. The V6 3-litre diesel offers the most frugal motoring. We were only a little short of the claimed 40.1mpg during our week-long test drive of the 3-litre. Pick petrol and you’ll be looking at fuel consumption figures which range from 23.4mpg to 24.9mpg. The diesel is also the easiest on the wallet when it comes to road tax, emitting just 184g/km CO2, which helps explain why this will be the model which accounts for the vast majority of UK sales. The petrol versions range from 264g/km to 289g/km. Jaguar finds itself at the wrong end of the Reliability Index, and while the XJ as a model has been around since the late 1960s, this is very much a new incarnation of the classic car. The 3-litre diesel engine is already to be found in Jaguar sister company Land Rover’s cars and we experienced no problems during our loan period. However, electrcial gremlins have been a popular cause for concern on the forums. The Jaguar XJ has not undergone Euro NCAP testing but comes with an impressive amount of kit to keep you out of trouble including dynamic stability control, twin front, side and curtain airbags as well as a useful blind spot warning system built into the door mirrors. It says something about a car when the entry-level trim specification is called Luxury. Specify Luxury trim and you get 19-inch alloy wheels, Xenon headlights, panoramic roof with electrically-operated blinds, leather heated memory seats and satnav. If that doesn’t meet your needs the next steps up are Premium Luxury and Portfolio while the XJ Supersports comes with its own trim level. Choose the XJ over its rivals and you will scoop more admiring looks than all its rivals put together. 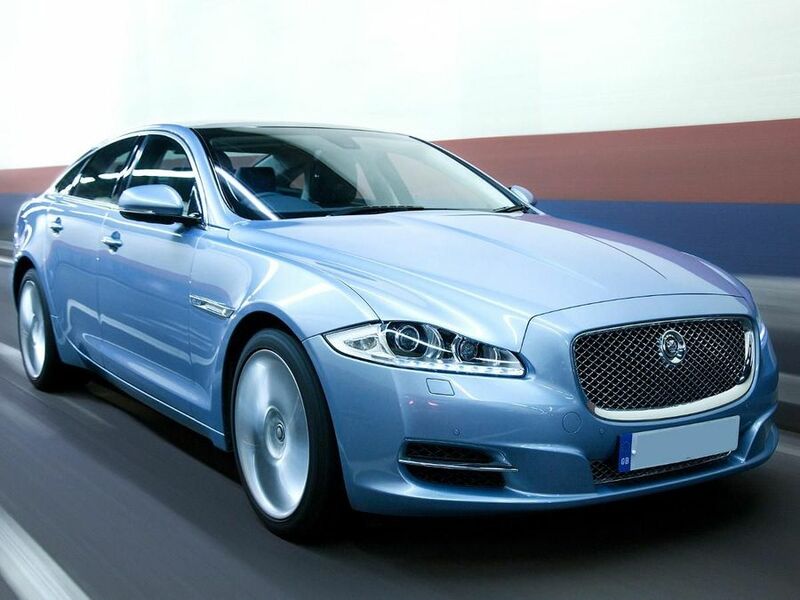 Visit the Jaguar website now for more information on the Jaguar XJ.